New Boston High School "Bears"
The village of New Boston is located on the banks of the Mississippi River along Il. Rt. 17. New Boston (population 632) is located in the western portion of Mercer County placing it approximately 40 miles due southwest of the Quad Cities. The town origin and school history are not clearly known. What is known is that New Boston took part in a consolidation effort after the 1959-60 school year of all of the schools in western Mercer County. 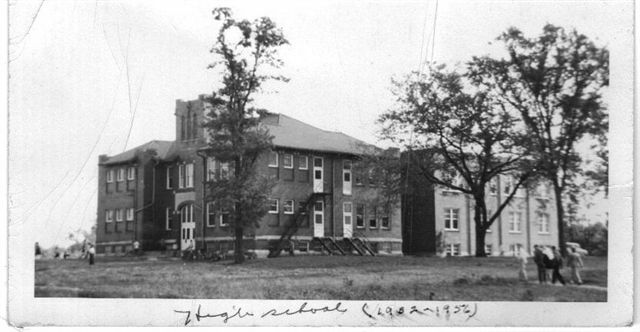 The result was the Westmer School system of which New Boston is now a part of along with Joy, Keithsburg, and Eliza. The high school for the new DIstrict is located in Joy. 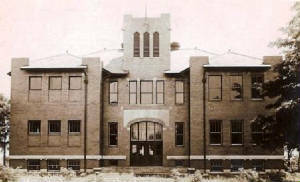 "Both the grade school and the high schools were housed in the same building. When a student came in the front entrance, straight in front of them was a stairway going to the second floor. Once you climbed the first set of stairs you either turned to the left and went to the 5th, 6th, 7th and 8th grade class rooms or continued up another flight of stairs to the high school homeroom and class rooms." New Boston does have an elementary school for the Westmer School District for grades PK - 5. 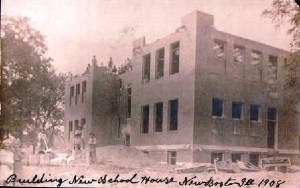 A portion of the original New Boston school building still stands and is used as part of the Westmer elementary school. The New Boston High School boys definitely participated in basketball, as you will see below. No evidence of other sports offered at the school could be found on the IHSA web site (www.ihsa.org) . It would be a good bet that New Boston offered Track, Baseball, and Cheerleading. Assistance with this information is being sought. The best seasons in which IHSA hardware was won by the Basketball team are listed below. Some scores involving New Boston High School were located on a website titled "Illinois Postseason Basketball Scores." These scores are listed below as well. New Boston's boys could shoot the rock! Two streaks define New Boston HS basketball. District titles were won in 41, 42 and 48, 49, 50 , and 51. The District Championships were followed up with Regional titles in 42 and 49. Unfortunately Coaches names and team records are not available, though one would assume the '42 and '49 records were quite impressive. All information prior to the 1933-34 season is needed. 1951-52 Postseason scores, record, and coach's name needed. **Final game for the New Boston High School "Bears". Consolidated with Joy to form the Westmer School District in the summer of 1960. "The boys used to play their basketball games, in the 1940's, in Baner Hall on Main Street in the upstairs portion of the building. The building is now the New Boston Community Center but the up stairs part has been closed. There is a New Boston High School reunion. This year there were about ninety attendees. Some memorable people from New Boston High School's past include Bus Thoman, coach in the 1940s, and Miss Mable Knox, principal through the late 1950's."